Seth Godin’s presentation at the Gel 2006 conference is a light-hearted romp through things that are "broken—illogical signs, confusing user interfaces, and flawed marketing tactics. Seth and Mark Hurst have an accompanying web site (This is broken) and a list of seven reasons why things end up broken. My favorite: "I’m not a fish" (people who create things but have no ability to put themselves in the position of the user) is at the core of our complaints about poor reporting interfaces. Tufte is really proud of this graph. He says this is the best graph ever made. I think he is completely out of his gourd and totally wrong. I think this is one of the worst graphs ever made. He’s very happy because it shows five different pieces of information on three axes and if you study it for 15 minutes it really is worth 1000 words. To make me take 15 minutes to study it doesn’t make sense. And I thought about it and I was going to jump all over him, then I moved it to this section, ’cause he picked it because it is broken on purpose. For the kind of person that you want to reach, they want to read a complicated, difficult to understand graph and get the satisfaction of figuring it out. Sometimes the best thing to do it so break it for the people you don’t care about and just make it work for the people you do. I think Seth has it just right. Personally, I can hardly resist a well-constructed infographic, but I have an unnatural interest in data. For the many business users, better to construct information displays that are simple and to the point. P.S. In the comments, you’ll find a thoughtful and heated debate about this graphic and the danger of simplifying information displays. 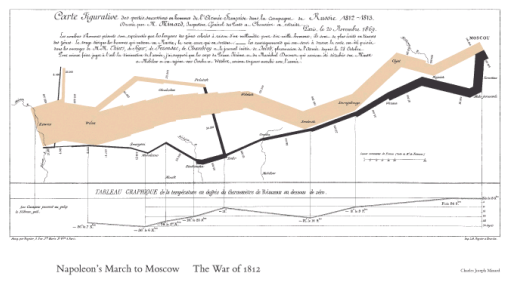 Simon Raybould comments that we might benefit by deconstructing the Minard graphic to make it more accessible to certain audiences. With that same thought in mind, I had set out to find the underlying data for Napoleon’s March. I thought it might be an interesting challenge to consider alternative ways to present this information—under the theory that different audiences require different approaches to absorb information. Here is the spreadsheet with the data—thanks to Robert Allison. It comes from this fascinating page that shows a gallery of re-constructions of this famous graphic.